Samsung’s just announced a major update to its Gear smartwatch, which is slowly but surely making a name for itself in a space crowded with Apple Watches and fashion pieces loaded with Android Wear. While all of Samsung’s competitors (apart from Apple) have embraced Google’s OS, Samsung continues to passionately beat the drum forits homegrown Tizen platform. This means there are far fewer apps available for the Samsung Gear S3 and it’s predecessor, the Gear S2, and it also means it will only really work with a Samsung phone. Yet if you’ve got such a phone in hand the Samsung Gears S3 could be your new (giant) smartwatch. Both dust and water resistant with a rating of IP68. There’s a myriad of improvements that the new Samsung Gear S3 has over the already pretty great Samsung Gear S2. The latest smartwatch from Samsung is fashioned to look more like a watch the previous Gear iterations, its watch face is protected from damage with the new Gorilla Glass 3 (reportedly as durable as Sapphire glass), the battery is larger (380 mA versus 250 mA), and Samsung Pay is built right in now. There’s the traditional NFC that other pay by phone/watch services use, and the newer MST, which lets the watch function more like your card and should, theoretically, be available at more locations than NFC (Samsung made such a claim during it’s briefing for the Gear S3). The watch also picks up a neat trick from the excellent Gear Fit 2 and lets you sideload up to 4GB of music or stream directly from Spotify. But the Samsung Gear S3's most eye catching feature is its size. The Samsung Gear S3 is HUGE. It’s 46mm wide. That’s 4mm wider than the Gear S2 and 8mm wider than my already large (for a slender wrist person) 38mm Apple Watch. For perspective, the average men’s watch is somewhere between 40mm and 42mm now days and the average woman’s watch rests comfortably in the 28-32mm range. In other words the Samsung Gear S3 is a big honking beast—sitting firmly in the watch size range of prestige time pieces from places like Breitling and Uboat. When strapped to your wrist the Gear S3 will, undoubtedly, be a statement piece, but without the goofy rectangular flash of the most popular smartwatch on the market. The current Samsung wearable line up. From top to bottom: Gear S3, Gear Fit 2, and Gear S2. And that desire to be a prestige piece is what I kept coming back to while being briefed on the watch. 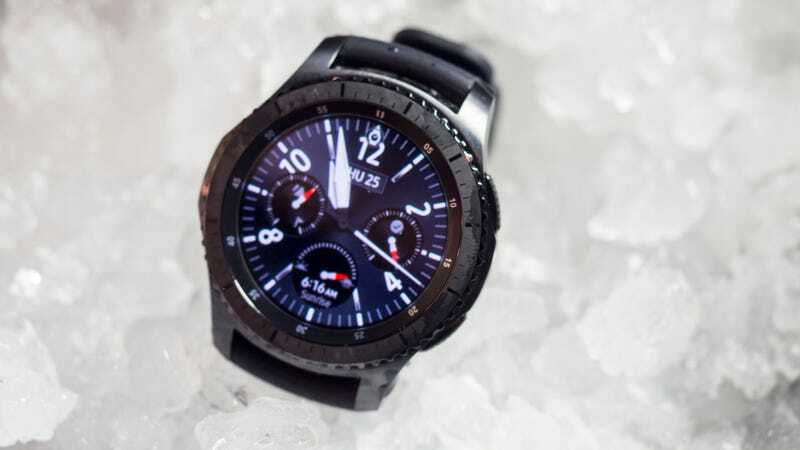 The Samsung Gear S3 will come in two versions that are identical beyond outward appearances: a rugged darker number labeled Frontier, and a traditional stainless steel one labeled Classic. From afar they’re gorgeous timepieces, and the ability to customize the watch face (a huge bulk of the 10,000 apps available on the Gear’s app store are for customization) means you can make it look like the $10,000 Brietling you covet. But cool customizations and paying for stuff with a swipe of your watch can’t hide the fact that this thing is a hoss. If you’ve got a slim wrist expect to look like you’re wearing a parental figure’s hand me down when this watch is available later this year (no word yet on pricing).